After a 26-year career working on both regional and global enterprises, Gordon Brothers Finance CEO Gene Martin brings an optimistic work ethic to the middle market. Gordon Brothers Finance’s newly appointed CEO Gene Martin has spent his 26-year career experiencing firsthand the changes that have shaped the modern global capital and credit investment markets. After several career-defining roles with Bank of America, Morgan Stanley and Credit Suisse, Martin has found a new home leading a team of fewer than 10 members at Gordon Brothers Finance, which he feels is one of his most compelling challenges yet. For Martin, leading a small team means enlivening the entrepreneurial spirit that comes from working with ambitious, like-minded individuals. In many ways, his latest role speaks to his very first job in specialized lending at Shawmut Bank, a super regional bank in Connecticut where Martin got his start in 1990. When his career led to joining Bank of America’s leveraged finance business in New York in 1995, the jump from buying syndicated loans at a regional bank to negotiating with large private equity sponsors was an unexpected — and welcome — challenge. During his time at Bank of America, Martin worked with one firm that wanted him on their own team. Martin’s time with DLJ instilled in him a mentality he would apply throughout his career: work hard, but make work a happy place to be. “I got to work for a gentleman named Harold Phillips, who was a really tremendous, tremendous guy. One of the most impressive people I’ve ever met in my life. I also worked with Steve Hickey, who was equally impressive. I got to work with Harold and Steve on the ground floor of the operation,” Martin says. In 2003, Martin switched gears and joined Morgan Stanley as the company restarted its leveraged finance business, beginning as the managing director on the loan desk to assist in driving origination in the U.S. 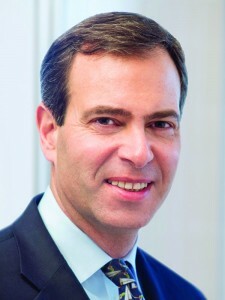 In 2010, Martin took over Morgan Stanley’s global leveraged finance business, responsible for both origination and syndication. Co-heading the business offered Martin a fresh global perspective. Throughout his career, however, Martin continued to have a lingering thought about pursuing a role on the buy side. As banks underwent greater regulation in 2008, he recognized the opportunity. In 2013, he left Morgan Stanley, hoping to find a role in middle market credit. Gordon Brothers was founded in 1903 by three Boston brothers, Jacob (J.B.), Louis and Joseph. For more than a century the company has expanded, and it is now a global presence. In 2014, the company launched Gordon Brothers Finance Company in partnership with BlackRock Kelso Capital. This division partners with senior asset-based lenders to provide maximum capital in its asset-based, cash flow and hybrid term loans to middle market companies. “It’s an opportunity to run a great firm with a really unique investment strategy. Personally, I would say I like working in a smaller team environment. Both have their pros and cons, but it’s fun to work in a small environment that’s more entrepreneurial and can move quicker. When you combine that with the market opportunity, it’s a really compelling situation,” Martin says. Given the diversity of Martin’s career, he’s experienced both the benefits and unique challenges that accompany working for businesses of different sizes. “You really have two ends of a continuum, and both are complex,” Martin says. “When you look at a global enterprise, there’s a complexity because they operate over many jurisdictions and currencies. In the middle market, the companies tend to be smaller, but there’s always a bit of a story with each one. They’re still complex. Oftentimes they’re family owned companies, and they’ve been through several generations. They’re sort of cognizant of those overlays on the business. Looking at the year ahead, Martin is optimistic for opportunities in both North America and Europe. Martin says this unique setting sets an ideal backdrop for the business. His first major challenge, he says, is outreach.